The views in this article are those of Dr. Katta and in no way reflect FSR’s organizational beliefs. These dietary recommendations were not reviewed or approved by FSR’s Scientific Advisory Board. Any changes to your diet should be reviewed with your physician in advance. Eating the right foods is one of the keys to overall health. It’s especially important for those with inflammatory conditions. We know that patients with sarcoidosis have an increased level of inflammation in their body. We also know that this may increase the risk of other systemic inflammatory conditions, such as high blood pressure (hypertension) and lung conditions. Which brings up one commonly asked question: can diet help? While there’s not been much research in the area of diet and sarcoidosis specifically, many research studies have looked at the role of diet in other inflammatory conditions. We now know that certain eating patterns can lower levels of inflammation in the body. For example, multiple studies have shown that certain eating patterns decrease levels of C-reactive protein. This molecule is found in the bloodstream, and it’s used to measure levels of inflammation in the body. What are these eating patterns, and what they do have in common? Whether it’s a cuisine-based diet (Mediterranean, Nordic) or guideline-based (DASH diet, MIND diet), at their core these eating patterns are focused on whole foods. They’re focused on a diet that includes lots of fruits and vegetables and other plant foods (including herbs and spices and nuts and seeds). Or as I like to say: heavy on the fruits and vegetables, careful with the meat and cheese, and look away from the sugar and refined carbs. This is an area of special interest for me. I’m a dermatologist, and for years I was asked by my patients: what foods should I be eating to help my skin? And prevent other problems? To answer that question, I reviewed the work of many researchers and scientists. I’ve now published multiple medical articles about the link between diet and different skin conditions. It turns out that the right foods can have a big impact on many different body systems. After reviewing these scientific studies, it was clear that there were several common threads. That helped me create a set of guidelines that would work for my patients with different types of skin conditions. As you make your daily food choices, it helps to think about these guidelines. Eat power means to choose foods that contain powerful nutrients. (The chart below provides a summary.) These nutrients include the antioxidants found in fruits and vegetables, and herbs and spices. That’s because antioxidants in food are powerful agents in the fight against inflammation. I also emphasize power fats, such as those found in nuts, avocados, and fatty fish, because nutrients such as omega-3 fatty acids also have powerful anti-inflammatory effects. When it comes to carbohydrates, think power carbs over empty carbs. 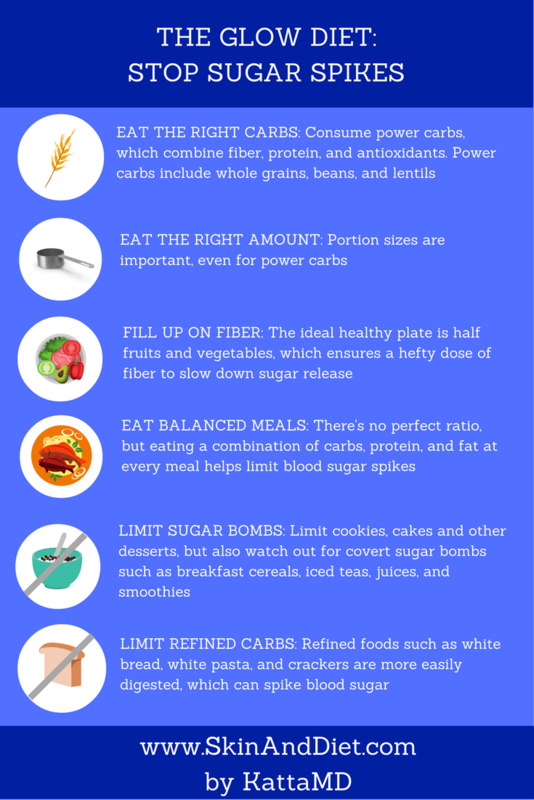 Power carbs, such as whole grains, beans, and lentils, add extra fiber, protein, and antioxidants. Empty carbs, such as white bread, white rice, and white pasta, have had these nutrients stripped away. It’s also important to think about foods that can help populate our gut with “good” bacteria. 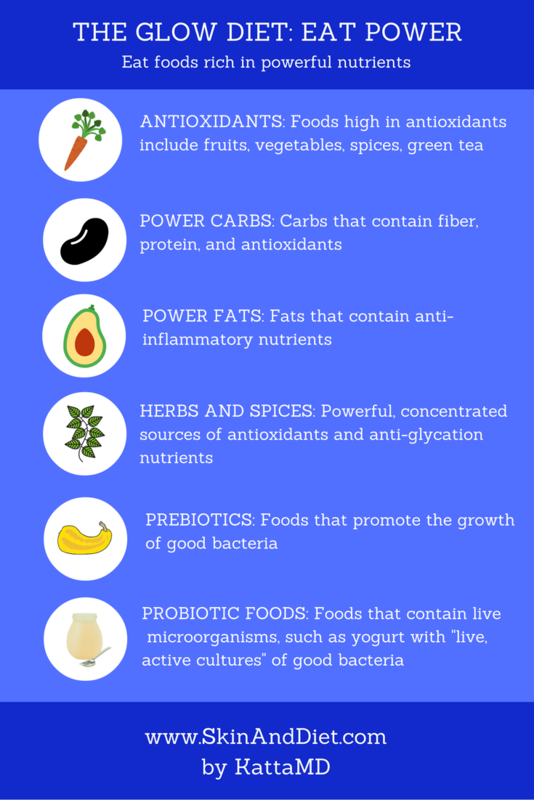 Probiotic foods are those that contain live active cultures of “good” bacteria. Research suggests that these beneficial bacteria in our gut may help decrease overall inflammation. It’s also important to feed these bacteria the right type of food. Prebiotics are foods, including fiber-filled vegetables, that help those good bacteria thrive. I also emphasize avoiding sugar spikes. What do I mean by sugar spikes? Certain foods, such as those with added sugars, can cause our blood sugar levels to quickly rise. This is known as a sugar spike, and it can promote inflammation. It’s not just added sugars, either–other foods can cause sugar spikes. The chart below has a few other tips. Author: Dr. Rajani Katta is a board-certified dermatologist and author who has lectured and written extensively on skin and diet. 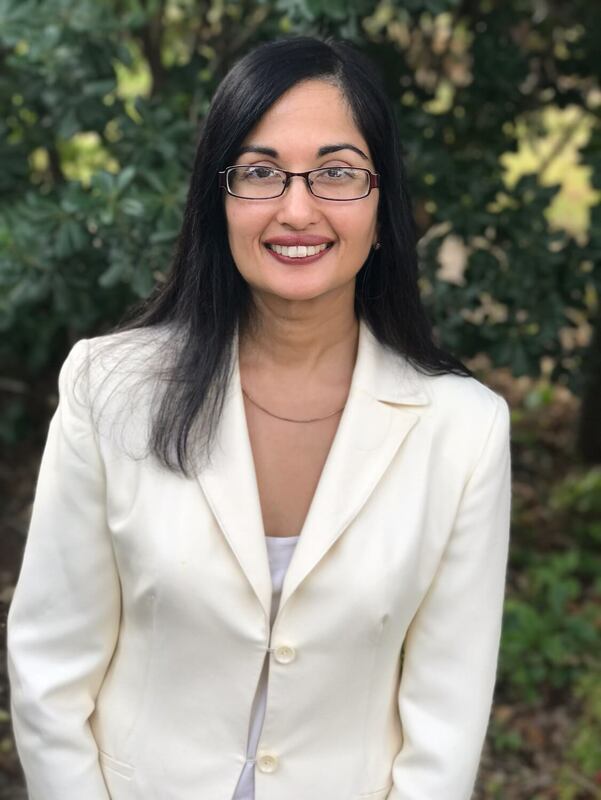 She is on the clinical faculty at Baylor College of Medicine, and provides evidence-based information to empower patients at www.SkinAndDiet.com.